I came across some beautiful flowers and plants on my way to the beach every morning, so I decided to do some FaceTheFoliage - Cuban style! The red hibiscus flowers were abundant there, everywhere you look! The yellow flower (the name escapes me - if anyone knows what this would be called, please let me know!) is from our trip to Havana. We stopped at a local restaurant to eat and right in the front of the building was this beautiful tree, in full bloom, the beautiful yellow buds just filled the branches. As we were walking out from the restaurant, an adorable local man handed me a flower - I knew I would keep it to create my Cuban girl - Celia de Cuba. Celia de Cuba fell in love with a Brazilian man named, Arturo. Every other night he would watch her dance at the Tropicana, where she performed in a great headpiece an African princess would envy. The night he was not there, he would go out to pick three hibiscus flowers: One for faith, the other for hope and last for love. When he professed his love, she turned up her nose. Arturo never came back. To this day, she wears a single hibiscus in her hair - for the one who got away. It's getting to the point in winter now where our skin is just screaming for help! A great remedy to start the year off right: Avocado. Avocado is rich in fatty acids which makes a great natural moisturizer for dry and unbalanced skin. With winter in full motion we could use all the help in the moisture department! *Baking soda is a great ingredient to use on your skin, especially for troubled skin. It allows the pores to open and eliminate the top layer of the skin that holds dirt and oil. Mix them all together in a small bowl. Use your fingers or a Masque Brush to apply it on your face. Leave it on for 10 minutes and rinse it off with warm water. Make sure to moisturize afterwards! Happy New Year to you all! I hope you had the best holiday season full of great memories. Let's cheers to health, happiness and love. 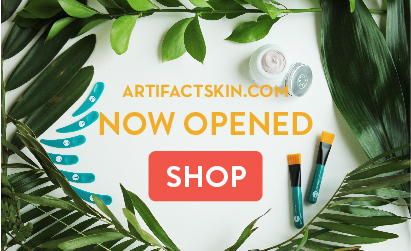 We've taken Artifact Skin Co. all over this holiday season. With only 9 months of experience, it was quite a learning journey but we had a wonderful time! Many of you have probably seen the hashtag, #FaceTheFoliage, all over Instagram - where a characteristic face is formed by cleverly placing left over flowers, leaves, sticks, etc. The first time I've seen this was on Justina Blakeney's Instagram page. I was just in awe of the simplistic beauty! I knew right away it was something I must try and when I did, I found it surprisingly therapeutic! One of my favorite herbal teas is peppermint. I always drink a cup after dinner. Because of its cooling element it helps sooth the pain of indigestion. It improves your bodies metabolism, allowing you to digest your food quickly. 1. Helps control oily skin: The menthol helps decreases the oil production, giving you more flawless and mattified skin. 2. Reduces irritations: the cooling property of menthol helps inflamed skin such as an insect bite, rashes, burns and most importantly acne.